File this one under "stuff-we-were-99%-sure-about-but-it's-still-nice-to-have-a-confirmation". Speaking at the Deutsche Bank 2016 Media, Internet & Telecom Conference on Tuesday, Disney CEO Bob Iger teased the upcoming Han Solo Star Wars: Anthology film ("Hanthology", if you will), confirming that Chewbacca will be appearing in the 2018 film. While it's a bit of a "No Duh" that Chewbacca would appear in a Han Solo film, it's interesting that Iger refers to the film as a "origin story about Han and Chewy". Could this be a hint that the film will tell the story of how the two first met? The story of their first meeting was originally slated to be told in the Live Action Series George Lucas was developing prior to the sale of Lucasfilm to Disney. Lucasfilm President Kathleen Kennedy said back in December that they were still exploring the possibility of developing those scripts, however this looks to be an element from that series that has been changed (if the series is ever produced). It seems unlikely that Lucasfilm would limit writers Lawrence and Jon Kasdan to what had previously been developed for the series. The Han Solo Anthology movie is slated for a May 25th, 2018 release and will be directed by Phil Lord and Chris Miller (21 Jump Street, The Lego Movie). 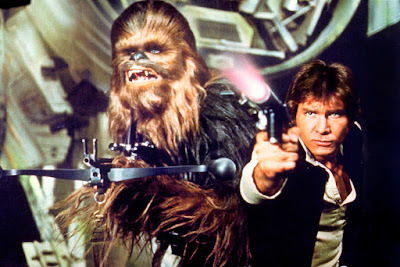 Are you excited to see a Han and Chewie origin story? Let us know in the comments! Please confirm that Anthony Ingruber got the role for Han Solo!! Please, he's our only hope and he's perfect for the role! The fans want him! The story in the chewbacca Comic when Han work to the empire meet chewy and liberete its awesome. Anthony Ingruber all the way!